Oberheim’s SEMs (Synthesizer Expansion Modules) were first manufactured in 1974 to allow users to play sequences using a small and relatively affordable sound generator rather than tying up a larger and more expensive synth such as a Minimoog or ARP 2600. People really liked the sound of the little box so, when Oberheim began building various numbers of them into cases that featured one or more keyboards and other paraphernalia such as programmers and sequencers, the larger models became some of the most revered synths of the era. But the smallest model, the 2-Voice, was a bit of a mythical synth — not because it was over-endowed and had an unhealthy interest in virgins, but because few players ever laid eyes upon one. You could occasionally gawp at grainy monochrome photos of the unwieldy 4-Voice and the gargantuan 8-Voices in the music rags of the era, but the little 2-Voice remained under the radar. This was a shame because its dual SEMs made it an unusually flexible synth capable of generating sounds that you couldn’t obtain from any other integrated synth of the era. You could also use its ‘mini sequencer’ to control the SEMs, sequencing SEM A while playing SEM B, or vice versa, or sequencing both simultaneously. All of this was packaged in a case with its own lid for transportation, and I have long wondered why the 2-Voice wasn’t adopted more widely by the likes of Tangerine Dream (who used many other Oberheim synths) or Neu!, or anyone else pushing the boundaries of electronic music at the time. Whatever the reason, it had disappeared by the end of the 1970s and, despite resurfacing occasionally in the hands of (for example) Liam Howlett of the Prodigy, it remained largely unknown for the next 30 years. The SEM is a relatively basic synth and, if you understand how the audio and control signals are routed with it, it’s hard not to obtain interesting or useful sounds from one. But this doesn’t mean that it’s all-encompassing — far from it, in fact. SEMs may have been responsible for some of the warmest sounds in synthesizer history, but you’ll not get one to imitate the Minimoogs or ARP 2600s that it was designed to liberate, nor even the simpler Japanese synths of the era. Each of its two oscillators generates just two waveforms (sawtooth and pulse/PWM waves) and you can only access one of these at a time. Low-frequency modulation is even simpler — just a sine wave. Similarly, the SEM retains ADSD contours, where the Decay and Release times are always the same. But if it has a trick up its sleeve (and it does) it’s its 12dB/octave multi-mode filter, which allows you to select a band-pass mode or sweep from low-pass through band-reject (notch) to high-pass responses. It’s hard to explain in words how different an SEM can sound when, for example, the filter mode is sitting halfway between low-pass and notch, but it generates a sound that most other synths can’t, and that sound can be superb. Tom must have been tempted to update the SEM when he recommenced manufacture in 2010 but, when I reviewed the first of the stand-alone versions (Sound On Sound, September 2010) he told me that he had designed it to be as close to the original as possible. At the time, I tested this by removing one of the original SEMs from my 4-Voice and comparing the two. Although the boards looked different and there were minor differences in the controls, it was clear that the underlying circuitry was the same. To be fair, testing revealed that the minimum and maximum cutoff frequencies of the new unit’s filter were different, as was its response to Env 2. There were also differences in the slowest contour rates, the maximum modulation depths and the maximum LFO rate, all of which meant that there were some sounds that could be programmed on the modern SEM and not the vintage one, and vice versa. But when I used the new SEM as part of the 4-Voice it proved to be a perfectly acceptable substitute, and it would have been a braver man than I who claimed that he could always tell which was which. I’m therefore surprised when I read comments from elsewhere stating that new SEMs sound (and I quote) “nothing like the real thing” and that vintage modules sound “way better” than the modern ones. In fact, I think that they’re daft. An original SEM offered a total of just eight audio input and output, CV and Gate sockets. Sure, Oberheim provided instructions on how other functions such as filter CVs could be tapped from the main board but, in 2010, when the CV & Gate version of the modern SEM appeared, it provided no fewer than 33 patch points on its top panel. Today, the TVS Pro offers considerably more, and you might think that its 56 3.5mm top-panel sockets and six quarter-inch rear-panel sockets include all of those from each SEM, minus those that would otherwise be duplicated. They don’t. For example, the second pitch CV input has been removed from each oscillator, as have the Sync In and Sync Out sockets. Likewise, the second CV input to the filter has gone AWOL, and the four filter outputs — low-pass, band-pass, high-pass and notch — have been replaced by two, one for the multi-mode low/notch/high signal, and one for the band-pass signal. Furthermore, the Env 1 and Env 2 trigger inputs have been discarded, as has the VCA output, and the dual audio inputs per SEM have been reduced to a single input per SEM. There are, therefore, 19 patch points on the top panel per SEM, and the other 18 comprise two 1-in/3-out multiples plus 10 sockets carrying CVs and Gates generated by the keyboard and sequencer: CV A and CV B out; Gate A and Gate B out; plus mod wheel, S&H, vibrato LFO, velocity A and B, and aftertouch out. Around the back of the TVS Pro you’ll also find the standard complement of MIDI In/Out/Thru on five-pin DIN connectors. Surprisingly, the synth only understands MIDI channels 1 to 7 (or 1 to 8 if you use the keyboard Split and Unison modes), and it both generates and responds to a very limited set of commands: Note On/Off (with velocity), transpose (output only), pitch bend, modulation and aftertouch. Nonetheless, this is sufficient for many purposes and, as a bonus, the CVs and Gates generated within the interface are output from the appropriate sockets, so you can also use the TVS Pro as a simple MIDI/CV converter. In addition to the patch panel at the front, a further six quarter-inch sockets are found at the rear, not to mention MIDI In, Out and Thru ports. The mini sequencer in the original 2-Voice combined a simple two-row, eight-step (maximum) sequencer with a Sample & Hold generator. You could set up Seq A (hardwired to SEM A) and Seq B (hardwired to SEM B) and then use the assignment switches to select whether each of the SEMs was controlled by the keyboard, the S&H, or the relevant sequence. It wasn’t the most powerful sequencer available, not was it the most intuitive, particularly with respect to the ways in which sequences were transposed, or in the way that the sequence tempo could be controlled from the keyboard, so perhaps that was why Oberheim called it a ‘mini sequencer’. As you would expect, the sequencer in the TVS Pro has been considerably enhanced. It retains the two rows hardwired to their respective SEMs, but now with a maximum of 16 steps and, unlike the vintage synth, its output voltages are now quantised to semitones rather than being continuously variable, so users will be able to set up musical sequences quicker and more easily than before. (It will also piss off the microtonal music crowd, who will have to look elsewhere.) Additional facilities include the ability to transpose sequences, to apply two-, three- and four-way ratcheting (multiple triggers on a given step), to insert rests, and to determine the gate length for all of the notes within a given sequence. Oh yes, and as one of a handful of Shift functions, you can set things up to start sequencing when you press a key on the keyboard. As well as generating CVs and Gates, the mini sequencer also talks MIDI, responding to MIDI Start and Stop commands as well as synchronising to MIDI Clock, although with a narrow range of clock divisions: one, half and quarter. It also sends MIDI Clock, Start and Stop messages as well as note information when it’s playing, the last of which is not always the case with integrated sequencers from elsewhere, and therefore welcome. However, the biggest difference between this mini sequencer and the original is the inclusion of a small flash memory that can hold up to 100 (50 sets of two) sequences. These can be used individually or chained into songs, with transposition and repeats of patterns, as desired. I found composition to be a bit fiddly and, initially, made many mistakes when trying to program songs, but it eventually seemed to work as intended. I’m confident that, had I had longer to work with this aspect of the TVS Pro, it would have become second nature. Just be prepared to swear a few times before you get to that point. The first thing you’ll notice about the TVS Pro is how small and light it is. Unfortunately, unlike the original 2-Voice, it’s no longer built into its own road case, but at least it still comes with an integrated power supply which, in these days of wall warts, is a relief. The key to using it starts with understanding the Assignments box in the mini-sequencer panel, which determines whether either or both of the SEMs are to be controlled from the keyboard, by the sequencer, or by the S&H generator (see box) and, when the keyboard is selected, how its various unison, split and polyphonic sub-modes work. The keyboard always responds with ‘last-note priority’, so these determine how retriggering is affected (or not) by legato playing, as well as whether the SEMs cycle on consecutive notes or whether SEM A can be held as a first note with all subsequent notes played on SEM B. Be aware, therefore, that the TVS Pro lacks the high-note and low-note priority options found on the stand-alone SEM and many other modern synths, which could be important if you’ve developed a soloing technique based upon one or another. Oberheim’s documentation makes a big thing about the SEM being analogue and ‘not just its signal path’, meaning that the contour generators and the LFO in each module are also analogue rather than being digitally generated and then converted to CVs before being applied to the VCO, VCF and VCA. From a sonic perspective, this doesn’t bother me one way or the other, nor should it you, although it’s obviously important with respect to the authenticity of the SEMs. Much more significant is the fact that secondary functions that could have slipped into menus are still controlled using knobs: the level of each SEM and its pan, the portamento time for each SEM, and the levels of the CVs generated by velocity and aftertouch. Strangely, the aftertouch knob doesn’t control the amount sent via MIDI, although the velocity knob does. I wonder why? Ah yes, the keyboard. Although your primary use for the TVS Pro may be as a sequence generator, for me the thing that raises it way above its ancestor is the provision of velocity sensitivity (with eight response curves) and aftertouch. The first of these is directed internally to the amount of Env 1 and Env 2 applied to the VCF cutoff frequency and the VCA Gain (which is the correct way of doing such things), while the second controls the amount of a dedicated vibrato oscillator applied to the oscillators’ pitches. But that’s far from the whole story, because they are also presented as a pair of CVs accessible from the top panel, allowing you to direct them to all manner of addition destinations. This is a huge step forward, and makes the TVS Pro an expressive instrument in exactly the way that Oberheims in the mid-1970s were not. The Two Voice Pro is based around its twin SEM sound generators and offers a comprehensive 56-point patch panel on its top. Despite all of these on-board performance capabilities, and despite the fact that its MIDI specification isn’t as advanced as that of the stand-alone SEM, I particularly liked playing the TVS Pro over MIDI. I connected it to a 76-note Roland workstation so that I was able to split SEM A and SEM B halfway up its keyboard, and play both (or control their sequences, if running) over a range of three octaves each rather than three octaves in total, and this opened up all manner of additional possibilities. I had huge fun controlling it using the workstation, running a sequence on SEM A while playing a solo line on SEM B while routing the Roland’s Mellotron patches (which were also being sequenced by the TVS Pro) back through both of the SEMs’ filters. It was instant 1974... Phaedra and Rubicon had never been this easy! The one drawback, for me, was that the TVS Pro doesn’t understand MIDI sustain, which would have been useful. I also had fun directing the output of SEM A through SEM B, and then cross-patching their audio and CVs to apply both LFOs to each of their sounds, or taking the audio frequency signals from one to cross-modulate the other, or both... and much more. The results could range from exquisite to cacophonous. But since this was taking me well into modular synth territory, I soon ran up against the absence of any patchable mixers or VCAs in the TVS Pro itself. So it was now time to stick it in front of a true modular synth, connect its rear-panel CV and Gate outputs to something sensible, route external audio back into its audio signal inputs, and see how it worked as a combination of controller, sequencer, sound source and external signal processor. It was superb; the marriage of the SEMs with a selection of Analogue Systems’ Moog and EMS modules was many a vintage synth enthusiast’s dream. Throw in a couple of Moogerfoogers and modern ambience effects and, well, you get the picture. My final experiment was to create some patches inspired by Roland’s LA Synthesis, wherein SEM A created the attack portion of the sound and SEM B provided the sustain and release. (The ‘chiff’ of a flute followed by its sustain is a good example of this.) With careful programming, paying particular attention to the crossfade between the two sounds, the results could be excellent, although there were some sounds that SEMs wouldn’t generate, no matter how hard I tried. I would have loved to have had the time to sample the successful patches that I created for later conversion into a library of polyphonic pads — an enhanced 8-Voice via the back door, if you like. 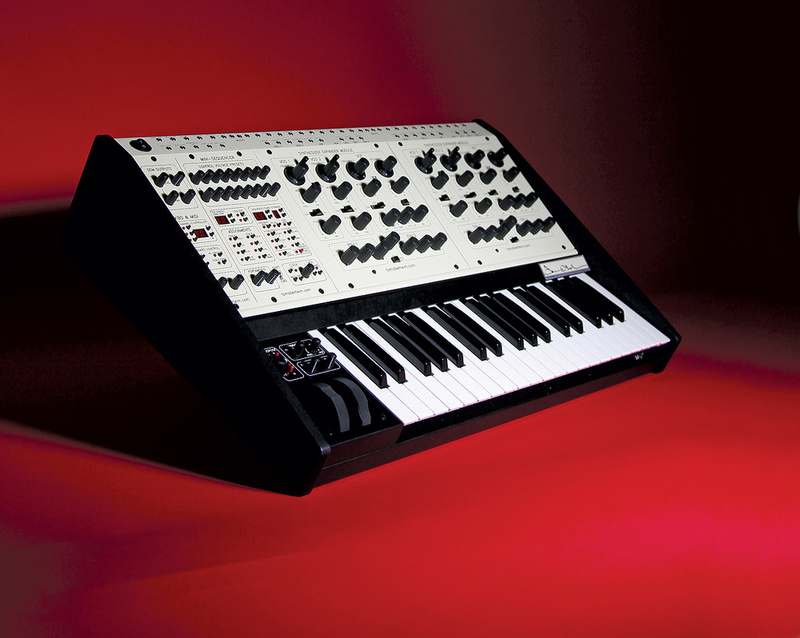 No synth is perfect, and the TVS Pro is no exception, although most of its shortcomings are minor or can be overcome. For example, I was surprised to find that, unlike the stand-alone MIDI-equipped SEM, the TVS Pro doesn’t understand MIDI CCs. I was also surprised to find that the keyboard isn’t polyphonic over MIDI. Conversely, I wasn’t surprised to find that the TVS Pro is slightly noisier than some other modern instruments. You can hear this as a quiet whistle if you switch off both oscillators and open the VCA. In the vast majority of cases this won’t be a problem, but it’s worth noting nonetheless. 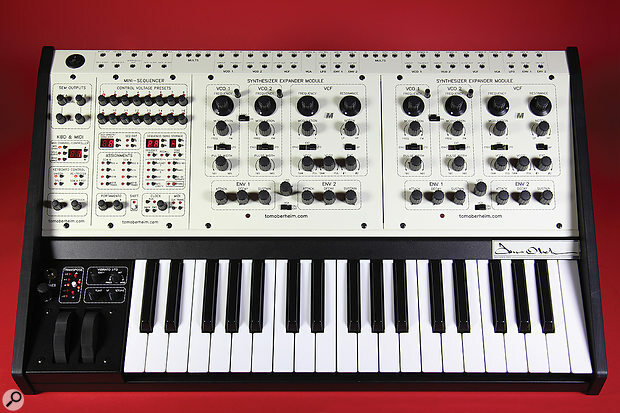 But here’s the biggie: Oberheim have tried to justify the TVS Pro’s lack of patch memories by saying that it’s an instrument designed to be played using its knobs and switches as well as its keyboard. I don’t buy into this. If I’ve spent hours refining sounds that work just so with each other and the sequencer, I would like to be able to save and recall them, whether tomorrow morning to continue writing and recording, or three years hence in front of 61,000 adoring fans at the opening ceremony of the new stadium at White Hart Lane. It would have been more honest to say that adding memories would have added considerable cost and complexity to what was already going to be an expensive instrument, and leave it at that. Either way, it’s a shame. I realise that I can’t save patches on my Minimoog or ARP 2600 either but, even as early as 1977, players could save most of the patch parameters on Oberheim’s OB1 monosynth and, nowadays, there’s no reason why you can’t combine top-quality analogue gorgeousness with extensive memories. Given what’s possible with the TVS Pro, and what strange and wonderful sounds you may discover one day, only to be unable to recreate them the next, you may find yourself swearing quite a lot. Finally, it’s worth noting that the manual is rather brief and doesn’t tell you everything that you want to know. For example, it doesn’t seem to mention that aftertouch is transmitted over MIDI, and I had to experiment to find how to move the keyboard split point. I admit that it’s clear and nicely presented, but it would benefit from being a bit longer and more encompassing. The TVS Pro is not a low-cost synth, but that shouldn’t surprise you. The stand-alone SEM Pro weighs in at a hefty £$1200 or thereabouts so, if you start with something similar to two of these, add a mini-sequencer and then place them all in a case containing a velocity- and pressure-sensitive keyboard, it’s inevitable that the cost will be significant. But synths based upon SEMs have always been popular, and they command prices that cannot be justified using conventional price/performance criteria; people like the sound and the ergonomics and are willing to pay for them even when there are more affordable ways to achieve the same results. If you’re a fan of the Oberheim sound and you’re looking for an analogue synth for lead, bass and sequencing duties, you shouldn’t overlook the TVS Pro. I’m not sure that there will be enough buyers to justify its existence, but I sincerely hope that there will. The world needs labours of love like this and, if it proves to be successful, it will be fascinating to see what Tom does next. There are a handful of third-party modules based upon the SEM (the Analogue Solutions SEMblance springs to mind), almost all which are more affordable and extend the capabilities of the original design. It would be simple to take a pair of these and connect them to a suitable keyboard and sequencer to emulate the TVS Pro, or you could start with the Telemark-K (essentially, a SEMblance with a keyboard) and build from there, although in all cases the results would lack the integrated neatness of the TVS Pro. Alternatively, you might be tempted to look toward newly conceived instruments such as the Moog Sub 37 and the DSI Pro 2. These are far from direct equivalents — the Moog is a dual-oscillator monosynth that can allocate its two oscillators to the highest and lowest notes played, while the Pro 2 is a quad-oscillator monosynth with a four-voice paraphonic mode — and there are many other ways in which they differ from the TVS Pro and from each other. But all three are excellent instruments, so it would be worth spending a bit of time to see which best suits your needs. 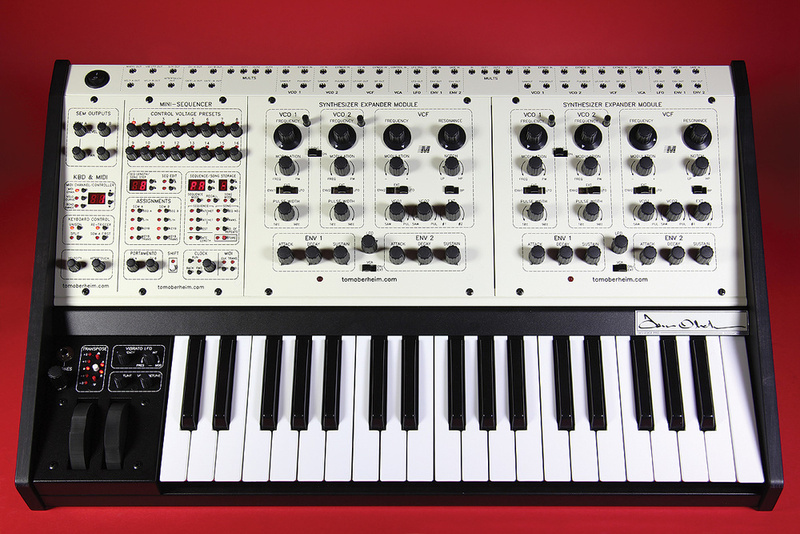 Shortly after re-launching the stand-alone SEM, Tom Oberheim announced that he would be releasing the SO4V ‘Son Of 4-Voice’ synthesizer. 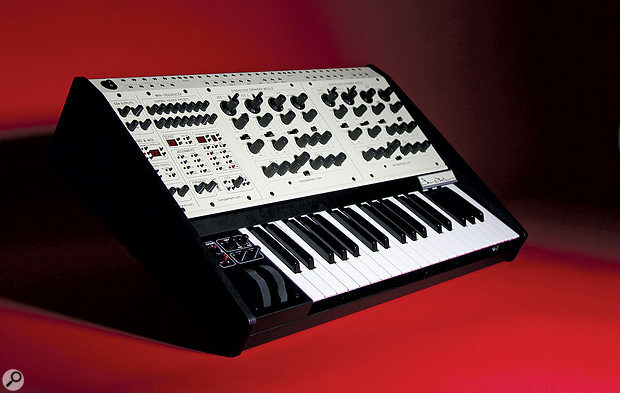 With a projected delivery date in 2012, this caused huge excitement among the analogue synth community. But the original launch was missed, as was the next, and the next, until people started to speculate whether it would ever appear. Then, at NAMM 2015, Tom told me that he had indefinitely shelved his plans for the SO4V, and that remains its status to this day. With the launch of the TVS Pro, you might be wondering whether you could add a couple of stand-alone SEMs to this to create your own 4-Voice, but I’m afraid that it isn’t possible; the keyboard decoder only generates CVs and Gates for two notes. The TVS Pro’s Sample & Hold generator acts as a third source of control voltages, the other two being the keyboard and sequencer. Internally, this is routed to the oscillators’ pitches although you can direct its output elsewhere using patch cables. It derives its clock from the sequencer which means that, for example, you can run one SEM from a sequence while obtaining random but synchronised effects from the other. Interestingly, this timing architecture means that you can also obtain ratcheted S&H effects, which is not something I can remember seeing on any vintage synth. Somebody is going to find a good use for this. It’s convenient, simple to use and sounds superb — an ideal combination. It’s semi-modular, and offers extensive connectivity. Unlike the original 2-Voice, it offers velocity and aftertouch sensitivity plus pitch-bend and modulation wheels. The sequencer is considerably enhanced when compared with the original. It’s not as fully featured as some of the alternatives. It would benefit from a more comprehensive manual. The TVS Pro has its limitations and, given its price, won’t appeal to everyone. But it’s stylish and capable, has a distinctive character, and can sound superb. It’s probably destined to become a modern classic.